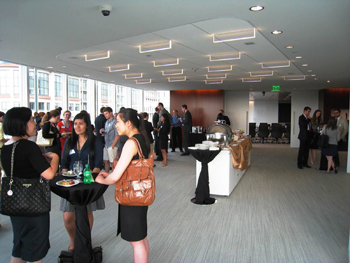 D.C. Illini Club hosts networking reception and discussion panel for U of I interns in D.C. This was the club's third Young Illini event, which is aiming to engage future members of the D.C. Illini Club and mentor U of I students. Savvy students and recent graduates know that both education and experience are necessary to stand out in an increasingly challenging job market. Throughout the year, students from the University of Illinois seek a competitive edge in their careers by coming to the metropolitan Washington D.C. area for internships in various fields, including government, policy, the arts, and many others. Recent alumni also venture to the area seeking to get a jump-start on their careers. These Young Illini are the next generation of the D.C. Illini Alumni Club. For this reason, the Club has been working to reach out to this group and cultivate them as members through a series of networking receptions and discussion panels coinciding with the beginning of the fall, spring, and summer semesters. 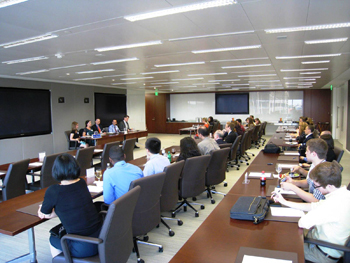 With support from the University of Illinois Alumni Association, the D.C. Illini Alumni Club held its third such Young Illini Networking Reception and Discussion Panel on Thursday, June 5, at the Washington D.C. office of the law firm of Hunton & Williams. Eighteen interns, many from the University’s “Illinois in Washington Program,” had an opportunity to network with 21 alumni. In all, the group represented nearly 60 years of University of Illinois classes - from 1958 through 2017. After the reception, a panel was held featuring five local alumni as speakers: Eric Hutchins (Hunton & Williams), Dan Iannicola (The Financial Literacy Group), Max Rodriguez (Deloitte), Susie Wachowski (freelance museum contractor), and Whitney Wyckoff (Greenwire). Discussion included topics such as: how to (and how not to) be a successful young professional, networking, translating an internship into a career, opportunities with the D.C. Illini Alumni Club, and life in the metropolitan D.C. area. Panel speakers answered numerous questions from the active audience, making the event a great success.